In this autobiographical story, Mia and her family live in California in a motel that they are responsible for managing. Someone must be at the front desk at all times, meaning Mia's parents rarely get enough sleep with customers coming and going at all hours. Important things keep breaking and need to be repaired or replaced - like the washing machine - and the owner, Mr. Yao, prefers to blame Mia's family and make them pay for the improvements. Their family can barely stay afloat, so Mia is constantly trying to find ways to help, including working at the front desk so her parents can keep up with cleaning all the rooms. She is kind and helpful and builds a network of friends, including other Chinese immigrants passing through, but how long can her family survive under the strain of these conditions? 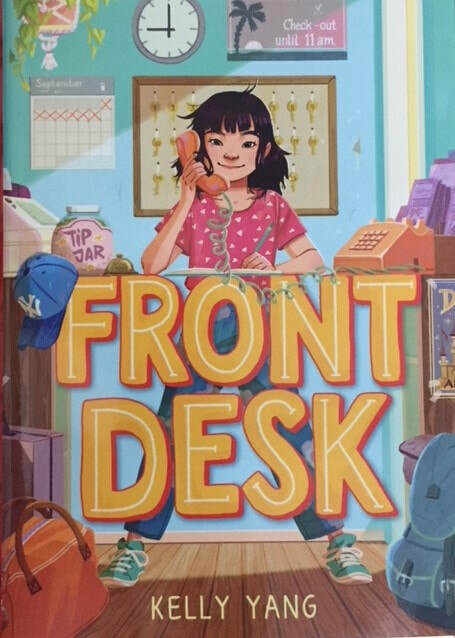 This is an excellent book that presents complicated issues in an accessible way for upper elementary readers, including things like interest, loan sharks, insurance, and investments. The book doesn't shy away from racism, which is prominent throughout the story. While the book doesn't become preachy, it does depict Mia standing up to combat that racism in effective ways. There is a subplot in which Mia's mother is judgmental about Mia's English, and keeps insisting that Mia spend less time on her writing in favor of developing her math skills. Although this is frustrating and hurtful to Mia, it rounds out the story even more, because there is tension between Mia's desire to embrace her independence even as she wants to help her family as much as she can. Although Mia makes some mistakes, she is strong and remarkably persistent, even when she experiences crushing setbacks. Whether readers have lived this story or never considered these challenges before, or fall somewhere in between, it's a book that reminds us to look out for each other and to always keep trying. I don't think that the young-looking cover of this book is a good fit for the deeper story it has to tell. "I wondered which was better - to have had something for just a second and then have it taken away, or to have never had it at all."